Dr. Harbeen Arora is the first recipient of the Presidential honor to any Indian. 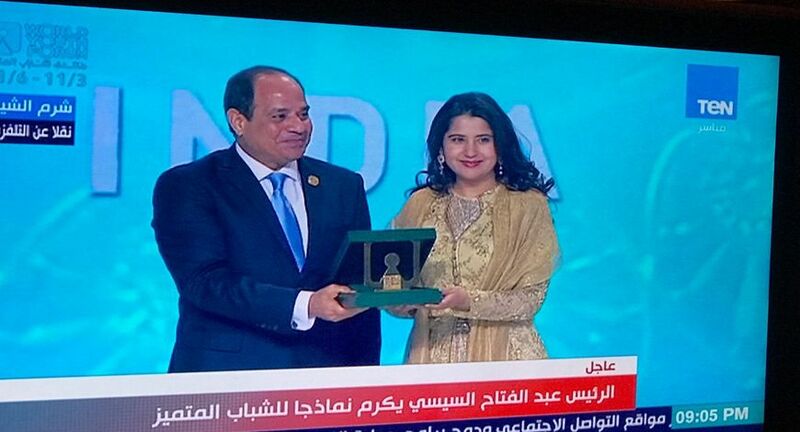 In a glittering closing ceremony of the week-long World Youth Forum (WYF) in Sharm El-Sheikh, President Abdel Fattah al-Sisi of Egypt awarded Dr. Harbeen Arora of India for her inspiring work in women empowerment as founder and global chairperson of ALL Ladies League (ALL) and Women Economic Forum (WEF). She is the very first recipient of the Presidential honor to any Indian. WYF 2018 attracted 5,000 attendees from 160 countries including heads of states and opinion leaders and large delegations of youth, providing a vibrant and powerful platform to explore and engage with peace-loving and pro-development ideas, toward integrating civilizations and cultures. Egypt will assume presidency of the African Union in 2019 and will also be hosting the Women Economic Forum, WEF 2020 with over 2000+ women coming together from 120+ countries, akin to the annual event held in India every year.